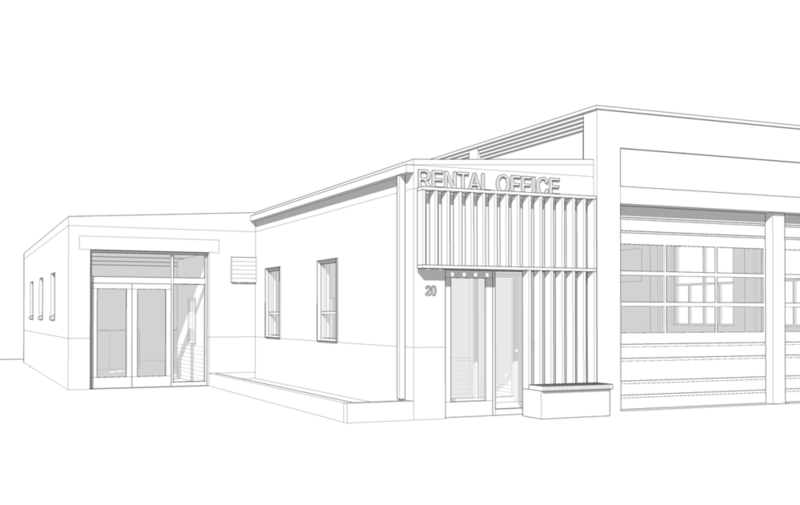 Peter Fuller Rentals commissioned BBSA to do a concept study for a new rental office for their Watertown location. Their current office is both difficult to find and to access, because it is located in a back corner of the property, not easily seen from the street, and four feet above the ground, accessible only by a flight of stairs. Three main garage bays lead into a large space used to clean vehicles to get them ready for the next rental. In addition to the rental car business, out of another bay is operated an electric bike rental business, Electric Bike Boston. Between these spaces is an addition that is unfinished and used as a break room and a for bike storage. That space and some space reclaimed from the bike rental shop will be repurposed and renovated to create a new rental and management office. In doing so, these pieces will find a more visible location relative to the street. But location is not sufficient in and of itself. Identity is equally important. The office needs to draw the visitor’s eye and stand out from the rest of the building, which is an agglomeration of fairly nondescript pieces that have been built over the years by previous owners. In this case, identity will be achieved with a custom wood screen that will sit in front of the storefront window on a concrete bench, where customers can wait in pleasant weather. In addition to catching one’s eye, the screen has the added advantage of filtering late afternoon sun as it comes into the office. Additionally, new windows will be installed on the north side of the office as will two skylights. The rental office will have a custom woodwork sales counter that will accommodate two employees. The office will connect directly to both the bike shop and the cleaning bays. The management office will have windows and a glass door affording it views into all the key spaces of the business.